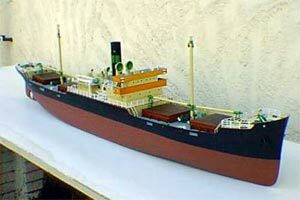 Melanie 11 is a model of one of a type of ship known as a TRAMP, or more correctly a Three Island type. Built in vast numbers at the beginning of the 1900's, this class of ship is still in service today. The engines were installed in the center section, along with most of the accommodation. This was to assist with the stability of the vessel. When first built, most of the type had an open bridge on an exposed platform. This was later modified to the raised enclosed type shown on the model which came in to service during the 1920's. Many were lost in both wars since they made up the bulk of the convoys. During W.W.11 large numbers of obsolete weapons were pressed into use to defensively arm merchant ships. The main purpose of the gun aft was to open fire on a U boat and force them to dive? ?, while the ship made its escape, virtually useless! This made the ships justifiable targets for the U boats and was thought to be one of the contributory factors that brought about the "unrestricted sinking" style of warfare. Plated fiberglass hull with loading doors and porthole detail molded into the hull. Decks are of 1mm plastic on a plywood sub-deck to give lots of strength for this small but heavy model, with lots of carrying power. The prototype is fitted with sound and smoke generators and brings the model to "life" for this attractive model. Plenty of cast metal fittings. Vacforms for the boats, funnel and all hold covers are included. The superstructure is of 1mm plastic. A FULL SIZE PLAN is the basis for the instructions along with a comprehensive instruction book.